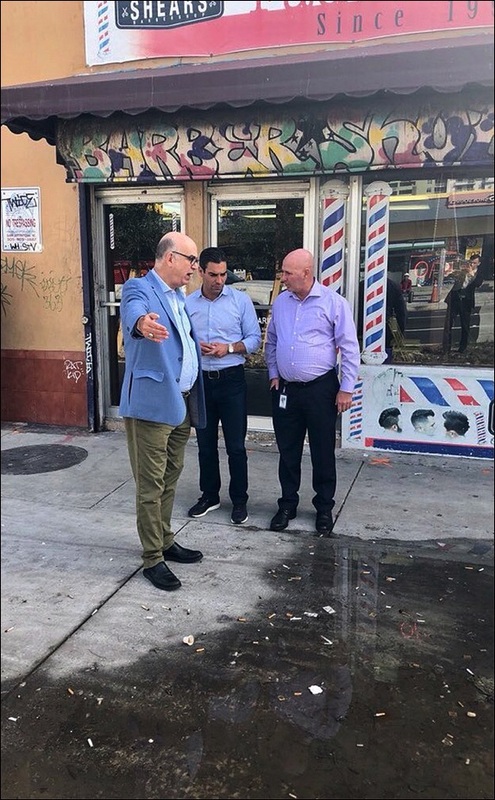 Over on Twitter, disability and community activist Alexander Carlos has been bashing the city and county politicians over just how ugly large part of Miami look because of graffiti and litter that are ominpresent everywhere you look. However, to make his point, Alex cropped the photo. If you look at the complete photo above you'll see a far more glaring problem than the graffiti: The sidewalk was not bult so it would drain properly. See the standing water. And then there's all the crap including cigarette butts, as well as more crap closer to the door, which is a reflection of what the property owner/store operator thinks about keeping the sidewalk in front of his store clean. Lastly, look at the reflecton in the window and you'll see one of Colonel Klink's high-priced aides taking the photo. Between Alex "Snakers The Bodyguard," Lampro shadowing Suarez like he's actually a VIP in need of protection, to the collection of aides that seem to photograph every thing that the Colonel does for posterity - you got to wonder if they take photos of him peeing - just what these travels around the city accomplish, because instead of getting better, things in Miami are actually getting worse, especially after a visit by these posers. After spending $97,251.54, on his campaign to stop Francis Suarez from becoming Strong Mayor, Joe Carollo seems to have needed some replenishment to his ECO, and so 6 contributors showed up in December to donate $50,000 to Miami First. 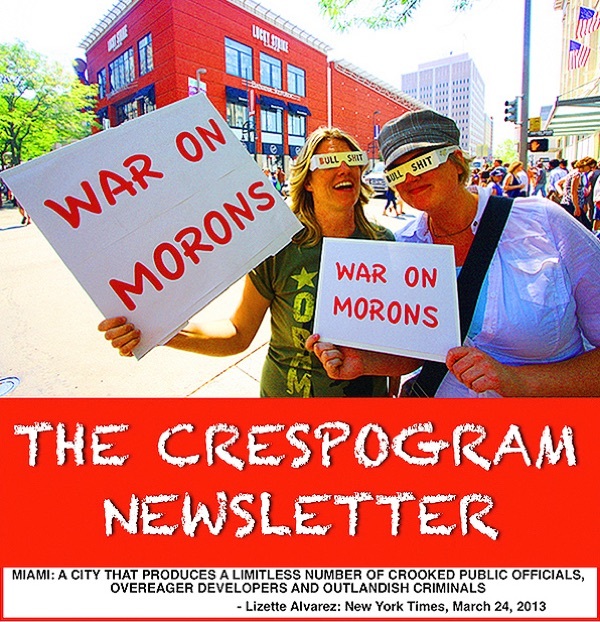 The $25,000 came from a PAC that is controlled by Ignacio Zulueta, and who is also associated with Academica Charter Schools, a company that the Miami Herald reported as being under federal investigation, and who became famous - or infamous - because they employed former State representative, and all around sleazeball Erik Fresen, who is the brother-in-law to Ignacio's brother Fernando. Elite Decor, owned by David Medina has been a regular donor to Carollo's ECO, as is Luis Mata, who is long time confidant and ally of the developers Joseph and Cecil Milton - they are the owners of The Grand, the luxury apartment building where I alleged in 2017 that Tomas Regalado had been living without paying rent for the last 2 years of his mayorship. 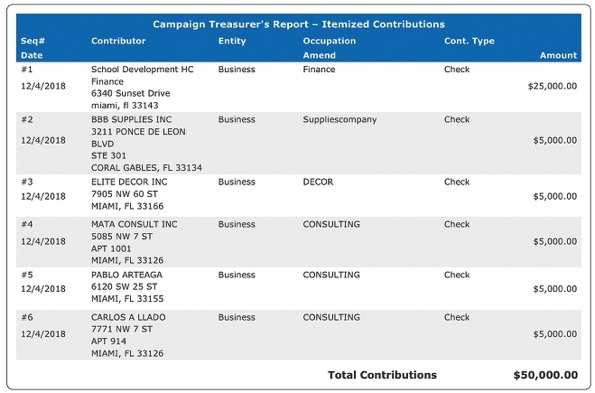 Pablo Ateaga is also affiliated with the Milton brothers as a permit processor, and he, along with his parents have given tens of thousands of dollars to campaigns, including Carollo's, which makes you wonder how folks who claim that they are retired, and as a permit processor manage to have so much disposable income? Carlos Llado, also works for the Milton brothers as the VP of Sales Admninistration, which kinda looks like either the Milton's want something from Carollo, or that Carollo knows somewthing about the Miltons.